Looking for a Used Borrego in your area? CarGurus has 89 nationwide Borrego listings starting at $4,000. Known as the Mowave in Korea, the Kia Borrego opts for a different desert name (after Anza-Borrego State Park) for its first-time entry into the body-on-frame midsize SUV market. The 2009 Kia Borrego will also be the Korean automaker's most powerful vehicle, thanks to its 4.6-liter Tau V8, borrowed from the upcoming Genesis. Although numbers have yet to be released, the V8 should deliver 300-plus horsepower and be matched to a 6-speed automatic. A 3.8-liter V6 will also be offered, with a horsepower rating somewhere between 250 and 270, paired with a 5-speed automatic. A clean diesel engine is in the works. 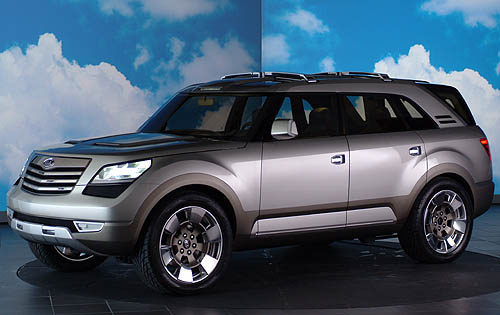 Borrego means bighorn sheep, and the 2009 Kia Borrego takes its name seriously, with flared wheel wells mimicking the rounded horns, and a muscular profile with chrome grille and lower body cladding signaling its rugged performance capability both on and off road. Two trims, LX and EX, will be available, each with front-wheel or four-wheel drive. The on-demand 4WD will have low-range gearing for off-road use. The 2009 Borrego seats seven people in three rows, with both second and third rows folding flat to expand cargo space. The second row also slides forward for easier third-row access. All trims will feature ABS brakes, dual front multi-stage airbags and side curtain bags for all three rows, and traction and stability control. Options such as a rearview camera, hill assist, an air suspension, and Kia's first-ever navigation system improve safety. 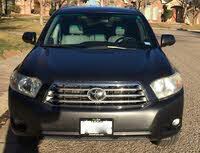 Interior features include a 6-CD player with iPod compatibility and three months of satellite radio. Utility is not forgotten in this SUV, as the V8 engine will be able to tow around 7,500 pounds (5,000 with the V6). As always, Kia's 100,000-mile/10-year warranty will be offered. Early reviews praise the safety features and upscale interior materials of the 2009 Borrego, but say the third row is cramped. There are questions as to whether introducing an SUV at a time when crossovers are becoming the preferred family vehicle is wise. Expected fuel economy for the Borrego will fall in the mid-teens. 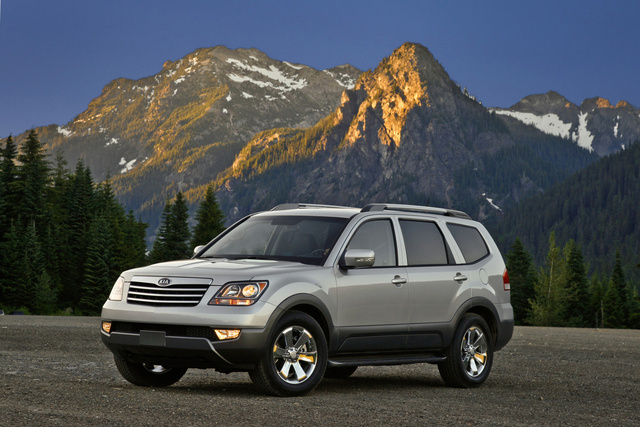 What's your take on the 2009 Kia Borrego? TheHorror You saw one of these today. Then you forgot about it. 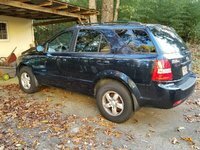 Have you driven a 2009 Kia Borrego? have had it back to Kia 4 times, works for a little but quits in a short time. last time was told they replaced the unit.